Lahore, January 29: A star-studded HBL PSL 2019 commentary panel including former South African captain Graeme Smith, former Australian batsman Matthew Hayden and former Pakistan captain Ramiz Raja was unveiled today. The trio joins world-famous commentators Danny Morrison, Michael Slater, Bazid Khan, Alan Wilkins and Kepler Wessels on a panel that is set to enthral viewers from around the world. South African legend Graeme Smith, who has made his mark as an accomplished voice behind the mic since retiring from international cricket, will be making his HBL PSL commentary debut this year. “Pakistan cricket always offers a lot of excitement and I am sure HBL PSL will be no different,” said Smith while sharing his views on joining the star-studded commentary panel. Smith will be in the commentary box for the first two weeks of the tournament due to prior personal commitments. Matthew Hayden, widely regarded as one of the most feared opening batsmen in recent history, has made his name as a commentator with stints in both international and league cricket. The former Australian opening batsman will be in the HBL PSL 2019 commentary box for the first week of the tournament. Former Pakistan captain Ramiz Raja, who has been a part of the HBL PSL journey from the very first game, makes an expected return to the 2019 commentary panel. “HBL PSL brings with it an air of festivity, joy and celebration,” said Raja, the leading voice of Pakistan cricket. These global commentary stars will be part of an action-packed coverage of HBL PSL 2019 that will be produced by world-renowned production company IMG Reliance. IMG Reliance is one of the major players in production of sports programming with extensive experience in producing content on behalf of rights holders, federations and leagues worldwide. Living up to its reputation, HBL PSL 2019 will bring with it state-of-the-art and innovative coverage including Hawk-Eye, Spidercam, stump cameras, umpire cameras and analytical support from CricViz. 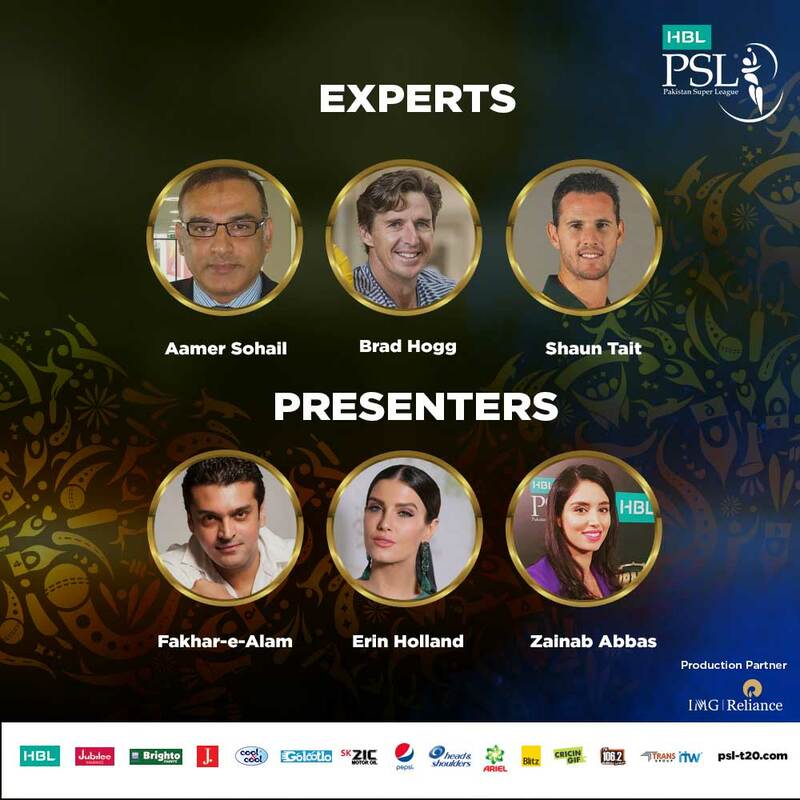 HBL PSL 2019 expands to five venues for the first time since the inception of the League and, keeping in view the ever-increasing fan base, the tournament broadcast comes with many additional features that also include a high profile panel of studio experts. The coverage will include exciting pre and post match preview and review shows with resident experts including former Pakistan captain Aamir Sohail, former Australian pacer Shaun Tait and former Australian spinner Brad Hogg. Erin Holland from Australia will join Pakistani presenters Zainab Abbas and Fakhar-e-Alam on the panel of presenters for this season. A galaxy of former and present cricket stars will assemble at the Dubai International Stadium for the grand opening ceremony on 14 February 2019 followed by four weeks of high octane and exhilarating on-field action.